Oh my goodness! What has Renault done now? It has brought a breath of fresh air to the world of motoring in the form of a two-seat machine aptly called the Wind that has such distinctive looks that it neither suggests a sports car nor a cabriolet, more likely a concept car heavily disguised. Closer examination and a week behind the wheel, proves that the Wind is a positive car, nothing negative about it for sure. The high back angular styled body is certainly a credit to its designers and even more so to those who had to fettle this machine at Renault’s Novo Mesto plant in Slovenia. What this Wind is all about is to provide its occupants with every opportunity to indulge themselves in open air motoring. The roof panel and rear window cleverly fold/rotate and slot into a storage area in the boot lid without actually stealing any boot space…the top literally disappears from view, replaced by metal mesh wind deflector. Transformation from snug coupe to open top takes a claimed 12 seconds and involves pressing a release button in the roof panel and turning a central release knob and then holding down the open/close switch and that’s it…commune with nature. First turn of the weather and reverse the procedure and be cosseted against the elements. Interestingly I found that the Wind in open form is very quiet enabling civilised conversation at speeds up to 70 mph though I noted that the noise generated by most other cars does not say a lot for their aerodynamics. With the roof in place there is a degree of drumming at certain speeds but I am not complaining, having cut my teeth on early sports cars where the hood was a crude folding arrangement held in place by nail breaking press studs. The two seats are low to the kerb and access to the driving seat might be a bit challenging for the less agile having to fit themselves around the steering wheel. The driving position, aided by a tilt/reach steering column, good pedal positioning and the well contoured sports seats with fixed head rests is very comfortable and provide the driver with generally a sporty/relaxed situation. The close proximity of the rear bulkhead obviously restricts rearwards adjustment of the seat which could be a problem for longer bodied drivers. Like a good suit/dress, have a first fitting. Cockpit presentation is smart, uncluttered and purposeful, highlighted by three conventional circular dials which are clear on read-out though the kph markings on the speedometer are hard to distinguish. The effect is business like, in keeping with the character of this unusual car. Two petrol engines are offered for the Wind, a 1.2-litre TCe 100 portrayed by Renault as flexible and a 1.6 VVT 133 lifted from the Renaultsport Twingo and this time described as feisty. This test involved the top version which proved spirited and yet a refined performer. Both engines use a short ratio five-speed gearbox (no automatic option) that felt a slightly notchy changer until warmed up and then could either entertain the driver or enable him/her to poodle along in a flexible manner. Performance? The Wind is no poser, the claimed top speed is 125 mph with 62 mph reached in a sprightly 9.5 seconds and plenty of gusto between the gears when there is the opportunity to play. There is plenty of driving character, some inherited from the good handling Clio II Renaultsport platform on which the car is based, some the result of further attention to the sophisticated suspension system. The end result is a good riding car on low profile Continental Sport tyres that also provides stable and positive handling machine that lives up to its promising looks. Good grip, well braked in a progressive manner and with strong safety margins but always with a good dose of fun. Driver vision is a good from the frontal view, horrible from the rear three-quarter angle as a result deep rear pillars - plenty of neck muscle effort required when negotiating angled junctions. There’s also driver aids in abundance including ABS anti-lock braking, emergency brake assist, stability control and under steer control. Economy is passable for a sporty performer with a an official combined consumption figure of 40.9 mpg which is about par for a medium sized hatch back. Carbon footprint is 160 g/km - clean but not squeaky clean. Worthy of note is the cruise/speed control that enables the driver to fine tune the pace by simple + or - finger touches; ideal for those tedious motorway workings where drivers struggle to hold strictly monitored speeds. Interior oddments stowage is a bit of a joke, being restricted to a non-locking small glove box and possibly a little room behind the rear seats though luggage capacity is an eye-opener - a generous 270 litres that is massive for a small sporting car. Equipment package at both levels is comprehensive, this top version coming with four alloy wheels (a puncture repair kit - space saver wheel optional extra), powered/heated door mirrors, immobiliser/alarm, automatic headlights/wipers, climate control, Bluetooth and much more. 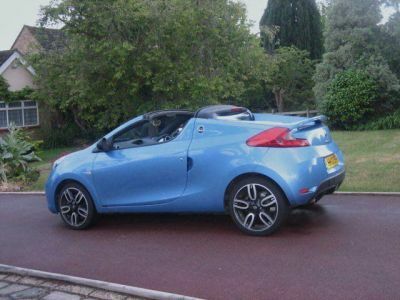 Just as Peugeot spotted a strongly viable market niche with the 207/8 Cabriolet, Renault has identified a potential sales winner with the Wind. Iconic is an understatement for this real head turner! Rivals include Mazda MX5, Peugeot 208 Cabrio, MG F, MINI Cabrio.